Lynn Hanson’s work stems from a rapt attention and visceral connection to the natural world: from a childhood stalking garter snakes at Whiskey Ditch in rural Minnesota to a daily ritual of exploring beaches and canyons along the California coast. Hanson’s studio, a long time in the wild garden of her Venice cottage, is now a WW II Quonset hut in Ventura along the railroad tracks, just above the Pacific Ocean. Amidst her cache of skulls, crow’s nests, black widows in mason jars, mermaid’s purses, and other finds, she transcribes her field notes. 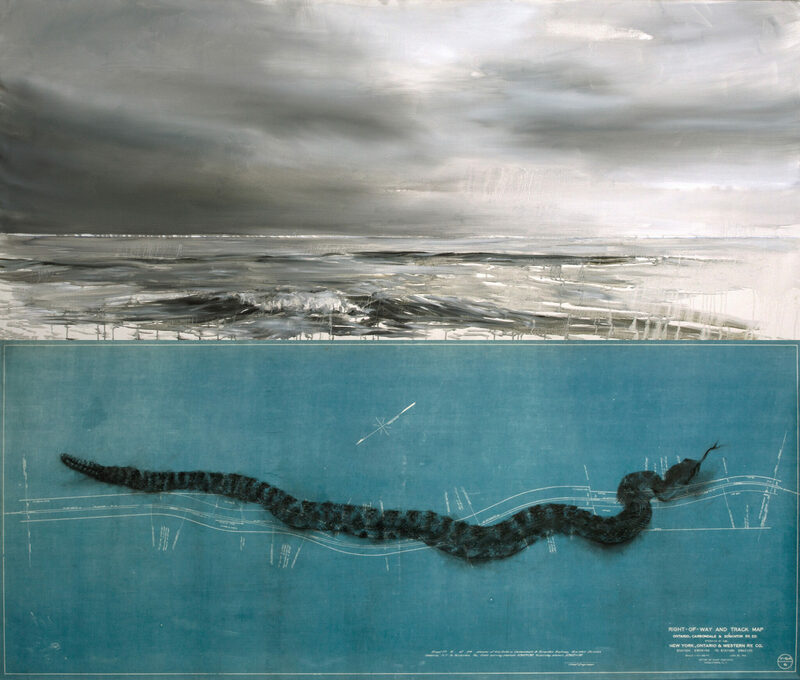 The work carries an undercurrent of longing: drawings of native wildlife on vintage maps, paintings: the gray sea, heaps of rope, and shelters of wrack and bramble, in addition, pinhole and chlorophyll photography from the wanderings. Lynn Hanson has exhibited internationally and is represented in many prestigious and diverse collections including LACMA, Ed Ruscha and San Francisco 49ers to name just a few. Her talk was sponsored by John & Cherie Brant. The AfterGlow was hosted by Martin & Virginia Furmanski.